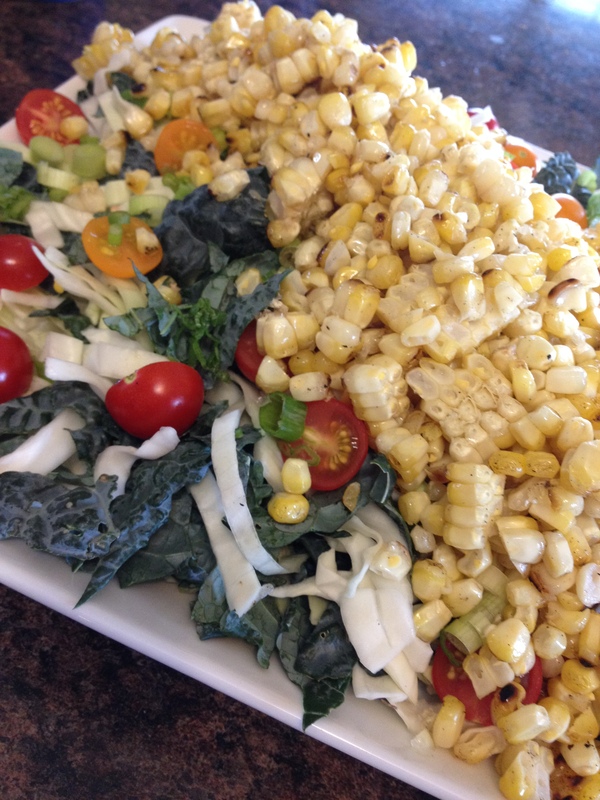 Grilled Corn with Kale and Cabbage Chop Chop Salad | This RD Eats! I have a confession to make, I am an Iowa girl and I don’t really like corn. Or maybe I should say that I am VERY picky about my corn. I have learned to tolerate it when mixed into a recipe, but typically shy away from “corn-y” recipes. 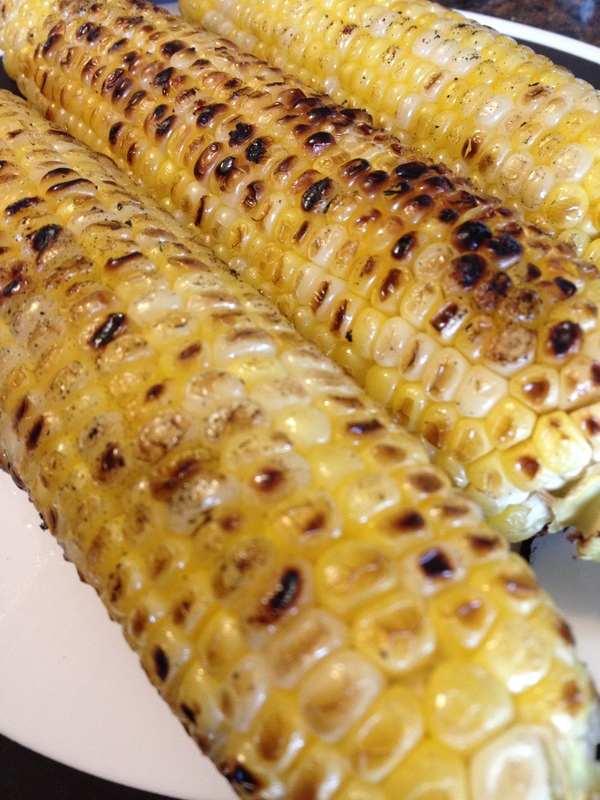 I will include the obligatory corn-on-the-cob once per summer (mostly so my kids don’t grow up complaining that they were denied corn), but besides that, you won’t find corn much on my menu. That’s right, no mid-week frozen corn as a side dish. As for canned corn, it makes me a little nauseous. Creamed corn? Fahgettaboudit!! Now, with that being said, I found my new favorite salad recipe and it features, you guessed it, – CORN! This salad has everything you could ask for. Garden-fresh ingredients, sweet, salty, tangy, crunchy, creamy. YUM! The original recipe is found here and I just made a couple changes because of the ingredients I had on hand. The process is simple. Grill the corn. Chop the vegetables and layer on a platter. Make the vinaigrette (totally worth the extra 2 minutes of work). Cut the corn off the cob and layer on top. 1. For vinaigrette, in a small container with tight-fitting lid, combine lime juice, olive oil, honey, jalapeno, cilantro and 1/2 teaspoon salt. Set aside. 2. Preheat grill to medium heat for direct cooking. Husk corn removing silk. Brush each ear with 1/2 tablespoon softened butter. Place corn over direct heat. Grill for 8 to 12 minutes, turning and brushing every 2 to 3 minutes with additional butter (total of 1 tablespoon per ear), until browned on all sides. Remove from grill and cool slightly. 3. Meanwhile, line a serving platter with kale and cabbage. Top with avocado and tomato slices. Using a sharp knife, cut corn from the cobs; discard cobs. Spoon corn over tomatoes. Sprinkle with remaining sea salt. Drizzle vinaigrette over top. 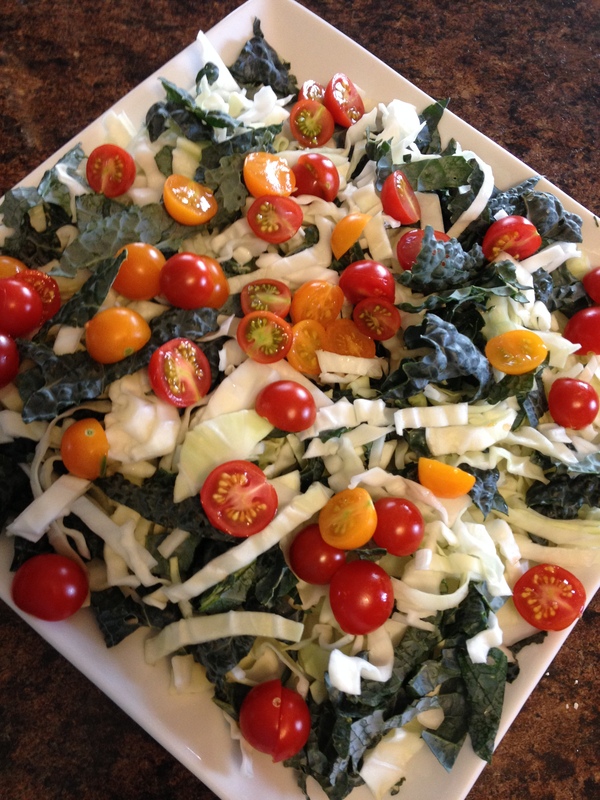 This entry was posted in Recipes and tagged cabbage, garden vegetables, grilled corn, kale, salad. Bookmark the permalink.